Royal Tire Inc was established in the year 1948 and has its headquarters located in St. Cloud, Minnesota. The Royal Tire Company operates as an authorized dealer for tire manufacturers such as Firestone, Bridgestone, BF Goodrich, Continental, Michelin, Goodyear, Yokohama, Road Master, Pirelli, and Toyo Tires. The company also offers mounted rim and wheel assemblies for automobiles. The Royal tire with experienced technicians provides services for batteries, struts, brakes, alignments, oil change, shocks, company, etc. It has locations in St. Cloud, Hibbing, Fergus Falls, Brainerd, Marshall, Shakopee, Montevideo, Minneapolis, Savage, Monticello, New Ulm, St. Paul, Virginia, and Waite Park, in Minnesota, Tomah, in Wisconsin , and Grand Forks, in North Dakota. There are currently 0 consumer reviews about Royal Tire available. Share your review. 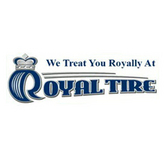 Please take a note that you are about to post a public review about Royal Tire corporate office on CorporateOffice.com. This review will be public, so please do not post any of your personal information on this website. If you would like to contact the corporate offices of Royal Tire, please use their contact information such as their phone number, website, and address listed above to contact them. However, sometimes staff from Royal Tire headquarters do read the reviews on this website.